The charge speed is expressed in "kW". Our regular fast chargers deliver a maximum of 50 kW and our new generation fast chargers a maximum of 175 kW. The charge speed is determined by the vehicle and depends on multiple factors. The graph underneath shows an example of a charge curve. 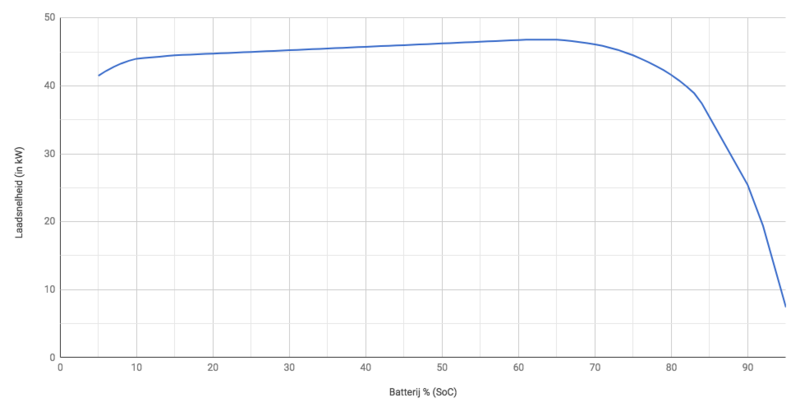 It shows the charge speed (vertical axis, expressed in kW) depending how full the battery is (horizontal axis). In this example the charge speed start to slowly drop when the battery is about 70% full. The drop is steeper when the battery reaches 80% and at 90% the charge speed is already reduced very significantly. The reason is that as the battery gets more full it has to be charged more slowly. In this example, fast charging above 80 to 90% of the battery is less useful, since charging will get progressively slower. The charge curve of each vehicle is different and depends on the design choices made by the vehicle manufacturer. In our support articles for each vehicle model we provide more information on the charge curve for each model. Another factor that can have a significant influence on charge speed is the temperature of the battery. A battery works optimally if the temperature is not too high and not too low. In practice this is usually between 20 and 30 degrees. In winter a battery can get very cold, for example if the vehicle is parked outside. This can cause charging to be (much) slower. Conversely, a battery can become very warm during a summer day and this can also cause charging to go slower. Driving a longer distance also causes a battery's temperature to increase. This can be beneficial in winter. The influence of temperature on the charge speed depends on each vehicle model. Some models are equipped with thermal management for the battery. In this way the battery can be cooled or heated depending on the circumstances. The effect of temperature is much less and the charge speed will continue to be optimal.